A delighted Cristie Kerr salutes her victory at the LPGA Championship. 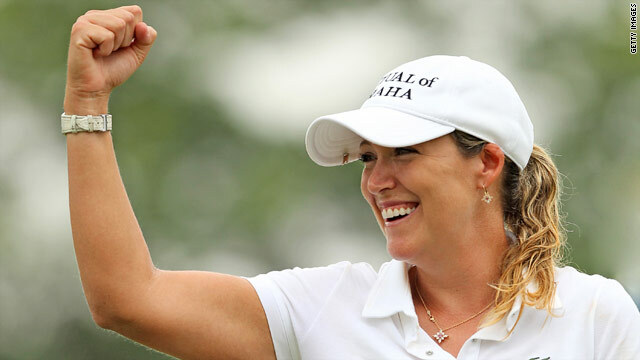 (CNN) -- Cristie Kerr is the first player from the United States to top the women's world rankings after her runaway victory in the LPGA Championship at Locust Hill Country Club in New York. Kerr carded a six-under final round 66 for a 19-under 269 total, leaving her 12 shots clear of the best in women's golf. It was a record victory margin in the LPGA Championship, beating the 11-shot win for fellow American Betsy King in 1992. Kerr was claiming her 14th career victory on the LPGA Tour and winning her second major after the 2007 U.S. Open. She led from start to finish as rounds of 68, 66 and 69 left her eight shots clear going into Sunday's final round. "It's a dream performance," Kerr told the official LPGA Tour website. "It's like you wake up or you dream -- I can't even speak right now. Winning by two or three is great, but winning by 12 shots is ridiculous. It's obscene." Kerr made sure of her victory by following six straight pars with three birdies in four holes around the turn. South Korea's Kim Song-Hee finished second with Japan's Ai Miyazato tied for third with South Korea's Shin Jiyai. Miyazato still leads the official money list after winning four times this season, but Kerr has overtaken her at the top of the official world rankings. She went into the major in fifth spot. Miyazato, who needed to finish in second place to keep top spot was impressed with Kerr's performance. "That's almost too good," Miyazato said. "She's just amazing. I played really good, too, but she is just better than me." The close race for world number one will continue at the Jamie Farr Owens Corning Classic in Ohio next weekend, but Kerr will skip the tournament to rest ahead of the U.S. Women's Open on July 8. Kerr is fully aware she will now come under pressure for the top ranking. "I'm there now, but I have to prove that I deserve to be there," Kerr said. "So there is still a lot of work ahead. But it feels awfully good right now."